The garden shed . . .
it is no longer just for tools and lawn mowers . I recently read an article that stated a garden shed is a must-have in every back yard. I know sheds are popular, and yes, I have an 8 x 12 barn-shaped unit for storing my lawn mower and garden tools. Just drive by any big box hardware or lawn and garden store and you will see a long row of garden sheds ranging in sizes from mini houses and barns to smaller structures. We have certainly come a long way since the 4 x 6 metal shed with sliding door. The yard barn, as I call it, is now a design element. But these structures are not just for lawn mowers and yard equipment. In recent years, do-it-yourselfers have begun to re-purpose these sheds or constructed a new one for one specific purpose. First it was the man cave/bar/den, and now the ever-popular she shed. Yes, women have claimed these once male-only domains for their own personal space. I think that is great. One of the most popular uses for a shed is for a home office or home business. Just add a chair or sofa and desk and computer along with some personal items and you have an ideal office setting. Make sure you run electricity to the shed to run the computer, copier, and other office equipment. 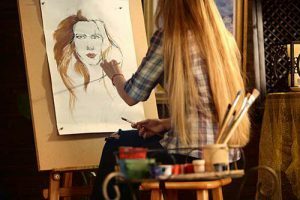 Artists are converting the shed into a studio. A great place for inspiration, and artists have great design ideas for the space. 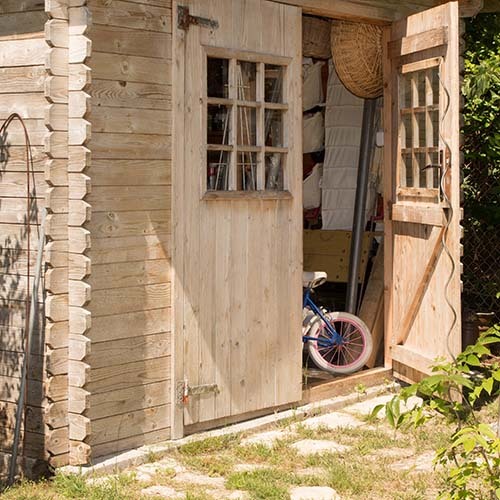 Kids need some personal space, too, and garden sheds make a great playroom or portable classroom. Great for home schoolers. Writers and students have also found serenity and a great creative atmosphere in their own shed. Musicians love the acoustics in their own little music rooms. I often play my trombone in my man cave. Many have turned the garden shed into a workout room and foregone the gym membership. Add some weights, stationary bike, treadmill and other equipment and you have a nice personal home gym. On a similar note, others have turned their sheds into a yoga sanctuary. 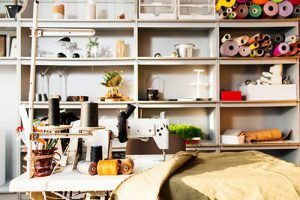 The shed is also the ideal space for crafting and quilting. plenty of shelves for storing material, yarn, and accessories. Really, does she need that much yarn? I have a number of friends that do woodworking and have their own space for creating beautiful wood pieces. I have always wanted to try my hand at leather crafting. It is on my bucket list. Whatever your vision for the space, Van Dyke’s has everything you need for your shed renovation project. From desk hardware and leather tops, shelving material and brackets, hinges, door hardware, locks, lighting, and milk paint, we have you covered. If you have repurposed a shed, post your pictures for us on our Facebook page. It may inspire someone to do a similar project.